This has been the most frequently asked question this week! A strange aroma has been haunting the Rose Walk and car park over the past few days. And the culprit - Colin the new Composter. The new digester that we have affectionately named Colin has been put into action and is now busy recycling our kitchen waste to make compost for the garden. The whole process takes as little as three weeks to complete with the first compost expected soon. However, Colin gets very hungry so Jim, our Kitchen Porter has been given the responsibility of feeding him fresh kitchen waste each day. Lucky Jim - or should that be lucky Colin?! Wow! We don't know what Sarah's secret is in the Kitchen Garden but her beautiful vegetables just keep on growing and growing! Last Friday show the largest harvest of veggies going into the kitchen - just in time for the summer menu. Included in this mega harvest were a mix of salads, spring onions, beetroot leaf, rocket and various herbs including rosemary, parsley as well as the very tasty hot and spicy oregano. Sarah's talents don't just end with veggies. She has also been busy growing sweet peas and cornflowers that now grace the tables in the restaurant. To top it all off, a vase of nicotiana, ammi majus, corn flowers and phacelia all grown by Sarah's fair hand is also on display for visitors to enjoy. As the new Kitchen Garden continues to go from strength to strength, to celebrate its re-introduction the garden team are experimenting with a new planting scheme in the East Court Garden. Gone are the spring displays of violas and in come the ornamental beetroots! John, our Deputy Head Gardener is a little worried that they may go to seed too early if the sun continues to shine but their vibrant red leaves look fabulous at the moment. The picture shows last years' pink theme in the East Court Garden. Never thought I would be heard saying this but, "I am desperate for rain". This spring has been the driest I can remember in over 30 years of gardening. We have had no significant rain since the winter. The garden team have been very busy for over 2 weeks planting out our tender displays, and we need to water then in in order to give them the best possible start. The stream that runs through the garden is practically dry. Phil who has worked at Hidcote for over 30 years says its only ever dried up a couple of times before and never in late May early June. 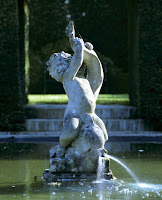 Let's hope we do not live to regret this, but please can we all do a little rain dance for the Hidcote garden team!!! We recently received the results for our tree survey carried out by the Tree Register - a group of enthusiasts that measure the largest trees within the UK. We have 3 National Champions which are the Aesculus indica in the Lower Steam which measures 19m in height with a girth of 360cm. Our second Champion is the Armenian Oak up in the Woody Wilderness, measuring 8m in height with a girth of 206cm. This specimen is in decline and we are presently propagating it. Our newest 'Champion' is not really a tree because it is multi stemed, but the Registra has listed it officially. It is the Osmanthus yunnanensis syn Forrestii with a height of 9m and girth of 138cm. We also have 19 County Champions which is a superb result when you consider within the county of Gloucestershire we have both Westonbirt and Batsford arboretums!